Celebrating This Holiday with Our Favorite Dreamworks Characters! When Santa and his reindeer crash onto the island of Madagascar, it’s up to Alex, Marty, Gloria, Melman and those wacky Penguins to save Christmas. Get ready for a sleigh full of laughs in this hilarious holiday classic, Merry Madagascar. And don’t miss The Penguins in A Christmas Caper! After Shrek promises Fiona and the kids a Christmas they’ll remember, he is forced to take a crash course in the holiday. But just when he thinks he has everything, Donkey, Puss in Boots and the gang crash the party. The Dragons are back in the exciting next chapter to the Academy Award -nominated film. The epic story of Hiccup and Toothless continues as they take flight in a thrilling, adventure to discover an island of never-before-seen dragons – Dragons: Gift of the Night Fury. Explosive action and fire-breathing excitement collide in this exhilarating story. Oh how I loved this Holiday special from Dreamworks. Not only did we get an opportunity to see Holiday specials with one of our favorite bunch of characters, but this movie included three different Holiday specials from Madagascar, Shrek and How To Train Your Dragon. All three different movies that have been favorites in our home for years and when we got the chance to watch them for a Christmas special, it made us love these characters even more. This is 85 minutes of laughter, great stories and holiday cheer and my kids just loved it. This certainly put us all back in the holiday spirit since we've all been sick with the flu lately. My kids loved the Madagascar Christmas story the best, mainly because of those crazy penguins. For me it had to be Shrek, I just love that big Ogre. This is definitely one Christmas collection you'll need to have on and see during this holiday and definitely one you and your family will enjoy together. Disclosure: All opinions are my own. 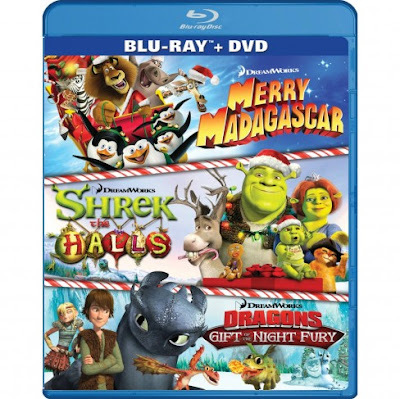 I received Dreamworks Holidays at no cost for the purpose of this review. No other compensation was received.